A couple of things happened this week that led me to wonder after older comic book shops. One is that a friend of mine moved into the same neighborhood as the now-closed Larry's on Devon, in Chicago, which is a place I shopped both in its late, double-location heyday and also right near the end (I bought a copy of the TCJ special featuring Jack Kirby and three old issues of Wings; comic stores are fantastic like that). 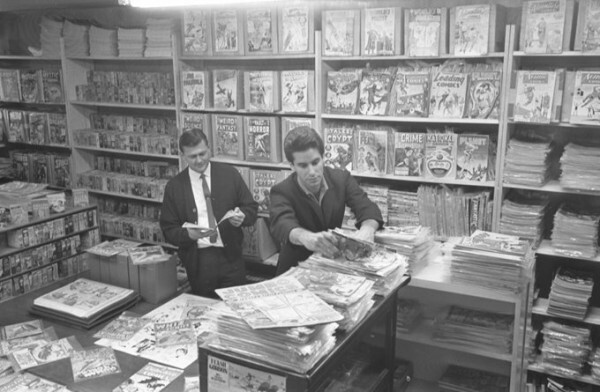 It was known as one of the early comics shops. Another is that someone asked me the question about the oldest comic shops in the US and abroad and while an answer was pretty easily google-able, I was curious that I didn't know the answer right away, and I'm not 100 percent sure that the answer I have is the right one. So what google indicated is that Golden Age Collectables is the oldest comic shop in North America still running, and that Lambiek has that honor in Europe. * Is that true? Are those the oldest comic shops still running? * What do any of you know about shops that were older that are no longer running? * When Lambiek makes the distinction that they're the oldest antiquarian comics shop, does that mean there are others that aren't antiquarian, maybe in London or Paris? * Are there are any comic shops you're aware of that are still operating from before 1975 or so? I'm particularly in any of those that might not be the oldest but are still old enough that when they did it it was like they did it on their own without a definite model in mind. * Are there locations that aren't comic shops the way we think about them still running from before either one of these shops? Like is there a newsstand that against all odds is still running in some weird place that's always carried comics, or a west coast bookstore with a little platform room full of old comics that is still operating that little room? Can anyone vouch for a specific spinner rack that's been around since LBJ or something like that? If it's curious to me, it's usually of interest to someone else. At least that's what I keep telling myself. By the way, I didn't know that Larry's had a second life as an eBay hub specializing in older, genre-focused magazines. Man, do I love such magazines. * John MacPherson notes in an e-mail that The Comic Shop in Vancouver was opened in 1974. * Gary Sassaman wrote in with the following description of Pittsburgh's Eide's Entertainment. My first comics shop experience was when I moved to Pittsburgh in March 1973 to attend the Art Institute of Pittsburgh. I joined the Pittsburgh Comix Club (the x had nothing to do with undergrounds, just a different spelling) and they met every month in a hole-in-the-wall store in Etna, PA run by Greg Eide. Eide's is still in Pittsburgh (downtown, near the convention center) and has been in existence since March 18, 1972 (according to their website), still owned and operated by Greg. It is definitely one of those old-school shops, with tons of back issues and books, Golden Age and Silver Age included, and some long-time employees that contribute to that surly comic book store vibe (but they're all a group of nice guys really). Greg branched out into music early on and then video and magazines. I haven't been there since 2007, I believe, but for the almost-20 years I lived in Pittsburgh, it was a weekly (if not more than weekly) stop, and I also actually worked at the store in 1980-81, when it was on Pittsburgh's North Side, right where PNC Park (the Pirates baseball stadium) is now, at the foot of the Sixth St. Bridge. * Steve Leiber seconded Eide's. * Now it gets interesting: RM Rhodes sent a note saying this article indicates that Barbarian Comics in Maryland has been open since the late 1960s. That would make it older than Golden Age Collectables. * And here's another potential oldest store. Clint's Comics in Kansas City has this up on their site, according to Joe Schwind: "Clint's Books and Comics has been serving the collecting community since October 1967. Jim, [Smokey] , Cavanaugh has been the owner since 1975." I started buying comics at liquor stores in Southern California. "Liquor stores" are regionalisms for what are now called convenience stores. 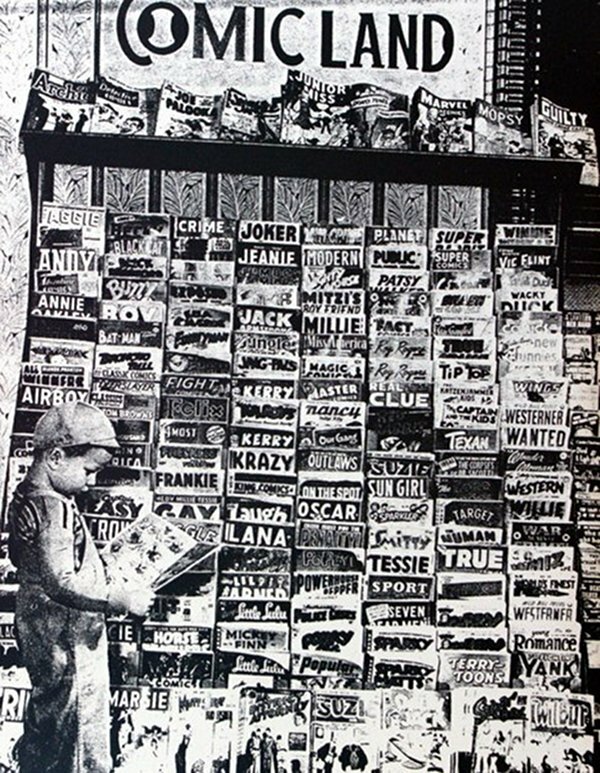 In the early '70s, I started branching out to newsstands in Hollywood, most notably the ones on the corners of Hollywood and Caheunga and Pico and Robertson -- both of which are still in business and, so far as I know, still selling comics. As for actual, honest-to-god "Comic Stores," my first one was Comics and Things in Hawaiian Gardens. I started going there in late 1972, soon after I got my drivers' license. (I have no idea how I heard about a store that sold only comics.) The store was in a little sort-of mother-in-law unit in back of a vacuum cleaner repair store, and run by a guy named Jim Smith, who was also president of the Paralyzed Veterans of America. After a couple of years, the store moved up the block to a larger space. I believe Jim sold it at that point, though it kept the same name until a few years later, when it was sold again, and became "Comic Books, Vol. III" (same location). At some point in the 80s, the store moved locations altogether, to Westminster, where it became Comics Unlimited, where it still stands today -- or did the last time I was in Los Angeles. Of course, there were stores in Hollywood that sold old comics -- the Cherokee Bookstore, Collector's Books, and Bond Street Books come immediately to mind -- but they didn't sell current issues; only "outrageously" priced Golden and Silver Age issues (that probably sold for the hundreds of dollars!). There were plenty of places that sold comics, but Comics and Things was the first LCS that I ever went to. * Jeff LeVine shot over an e-mail to remind me that Hi De Ho has been in existence since 1975. That's probably the most high-profile shop on this list. * Dave Knott noted in an e-mail that there's also a Golden Age Collectables in Vancouver, which makes that city the only one of which he's aware that has two stores operating since before 1976. That's super-interesting to me, although I bet that's just the way things turned out. * Kurt Busiek wrote in to say that he walked into Million Year Picnic for the first time in 1974. This article says that the store opened in March of that year. That is an equally high-profile shop and I would say has a higher-profile than Hi De Ho in terms of its alt- and indy- qualities for sure. Great shop. * Stig Olsen says there are two pre-1975 comics shop still operating in Copenhagen: Fantask, Pegaus. He'd guess 1971 on the first, 1973 on the second. Thomas Thorhauge says October 1971 for Fantask and links to this gallery. * Jean-Paul Jennequin suggests a store in Paris might have been operating a full five years before Lambiek. I don't know much about specialty comic shops in the US and the UK, but I must tell you about one in Paris that has been in existence since the 1960s. It was originally called "Librairie des Jeunes" ("Young People's Bookshop") and was run by Editions Dupuis (hence it was often called "Librairie Dupuis"), publisher of the weekly Spirou (still running, by the way) at 84 boulevard Saint-Germain, in the 5th arrondissement of Paris. This was, for lack of a better term, a comics specialty shop. It carried not only books published by Ã©ditions Dupuis, but also by their main competitors at the time, éditions Dargaud, éditions du Lombard and Casterman. Dupuis and Dargaud dabbled with children's books in the '60s, so there were those too, but the shop was overwhelmingly comics. It had already been running for a few years when I became aware of its existence in the late sixties. To say that it blew my young mind would be an understatement. Here was a bookshop that sold nothing but comics -- so it seemed. I say "so it seemed" because the first few times I went past it, the shop was closed because it was Sunday, and I was left with this tantalizing sight of shop windows full of comic albums. I finally managed to call on shopping days in late 1970, early 1971. The shop not only had new comics, it carried fanzines (I bought my first issues of Phénix there) and foreign imports - I remember buying Steranko's History of Comics, Batman from the '30s to the '70s and Superman from the '30s to the '70s (hardcover editions, huge investments for my 11-year-old budget) and Zio Boris, a hardcover collection of an Italian comic strip that was a spoof on horror movies. The shop has been in poperation continuously since then. It did change hands at least a couple of times and is now part of the "Album" franchise of comic shops. What more, it seems to have spawned other comic shops, as there are a half dozen in the surrounding streets now, especially rue Dante. Now Lambiek claims to be the oldest antiquarian comic book shop in Europe and this is true, inasmuch as Librairie Dupuis/Album never sold used comics. But it seems to me most of Lambiek's business is now, and has been for quite a while, new comics. As far as sales of new comics go, Librairie Dupuis/Album was there first. While searching the internet, I found this page with advertising flyers for Spirou-related events. If you scroll down, you'll see a flyer advertising a signing of Morris, Goscinny, Roba and Remacle in 1963. That's five years before Lambiek's opening in 1968. This shop is about a mile south of Larry's location, and still only sells comic books -- current titles and back issues -- no toys, t-shirts, games or anything else. According to this article, "Variety opened at 4602 N. Western Ave. in 1974 or 1975, under its two original owners. "Rick Vitone died a few years ago and left the shop to a customer. Here's a recent blog post about the shop. I like this detail : "When customers suggest that he update the posters to reflect newer titles, he simply states that he likes things they way they are, they way they were when he came in as a kid. Vinny has in fact never been to another comic book store in his entire life." * Brian Hibbs wrote in to say that he though Gary Arlington's outfit was the first west coast comics shop, but of course that one's not still running, have shut down when Arlington began to suffer from health problems. Far as the Uk goes, I think these are the oldest. Nostalgia and Comics in Birmingham as a retail shop opened in 1976 -- the store owner had operated a mail order and market stall business since, I believe, late 1974. Science Fiction Bookshop which was my first shop and seamlessly changed into Forbidden Planet Edinburgh at a later date was opened in late 1975 -- which i believe makes it the country's oldest store. I think Forbidden Planet London opened in 1976 after the UK's first store, Dark They were And Golden Eyed (which I think opened in 1972/3) began to fade. Might not be 100 percent -- long time ago -- but pretty sure those timings are pretty close. Just a minor correction. The first London comic shop Dark They Were And Golden Eyed opened in Covent Garden in 1969 not 1974 and it closed, two changes of location later, in 1981. London Forbidden Planet opened in 1978 so is now the oldest London shop, followed by Mega City Comics in Camden (1981 -- the oldest in the same premises) and Gosh (1987 or thereabouts). * I went and checked the comic book shop of my youth, Comic Carnival, and they say they've been around since 1975.